Mariglo Laririt (Director for Sustainability) and Laurent Lamasuta (President and CEO) accept the award on ENR’s behalf. 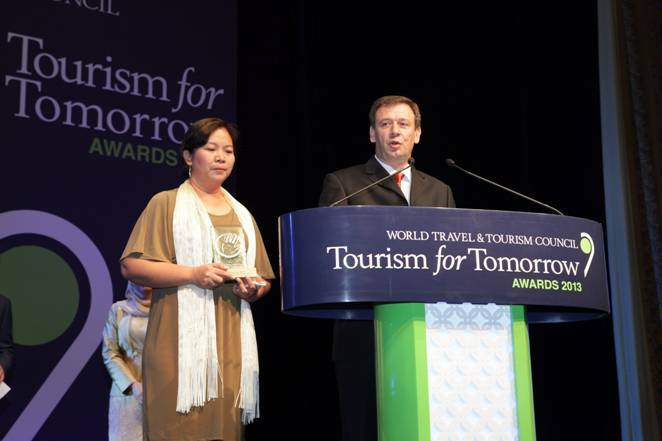 El Nido Resorts was awarded the World Travel & Tourism Council Tourism for Tomorrow Award 2013 for the Community Benefit category last April 9, 2013 during the WTTC‘s 13th Global Summit in Abu Dhabi, UAE. 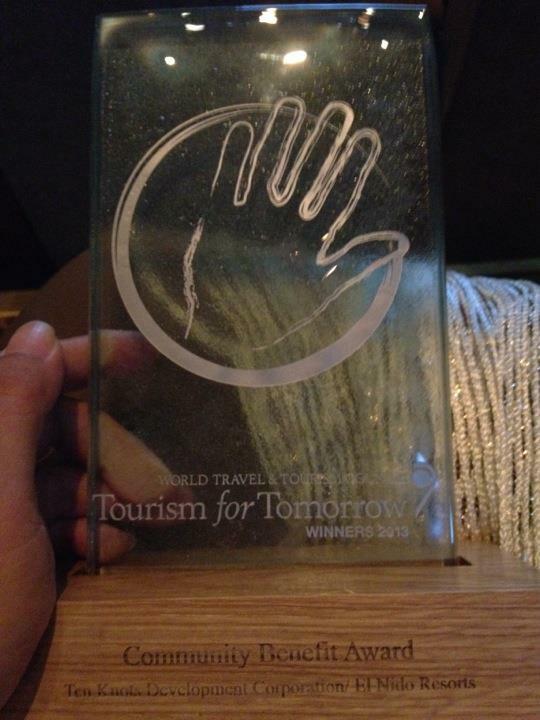 Tourism for Tomorrow is one of the most prestigious awards in the travel and tourism industry. Entries are judged by an international team of experts, including a site visit. Costas Christ, Chairman of Judges, visited El Nido in February to observe resort operations and interview key personnel and members of local government, non-government organizations, and the Protected Area Office. Ten Knots Development Corporation’s Director for Sustainability, Ms. Mariglo Laririt and TKDC President Mr. Laurent Lamasuta received the award on ENR’s behalf. The other Awards categories are “Destination Stewardship”, “Global Tourism Business”, and “Conservation Award”. The Tourism for Tomorrow Awards attracted 133 applications from destinations and businesses in more than 46 countries on 6 continents worldwide. Previous Why go diving in Bacuit Bay, El Nido? Next What does it mean to win Tourism for Tomorrow?